The pincers of a 360 million-year-old fossilised scorpion (file photo). There's a lot of information about geomythology from places like North America, Europe and China. But very little is known about this field on the African continent, and particularly in southern Africa. We found this surprising: the region is home to the "Cradle of Humankind", a world heritage site. 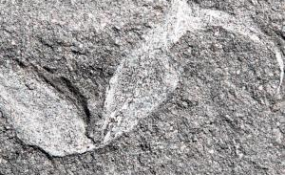 It's of critical importance in the origin of modern humans and has a tremendous fossil record, which includes numerous vertebrate trackways - the footprints that ancient species left as they moved around the landscape. We set out to better understand southern Africa's geomythology. This was done using our combined knowledge, as well as literature searches. Our study features 21 sites across southern Africa - and also lists sites elsewhere in Africa, like Uganda, Tanzania, Cameroon and Algeria - that show evidence of geomythology among pre-scientific societies. Quartz - and its relationship to beliefs on spiritual sight - figured prominently in our findings. One notable example was a large quartz crystal manuport from the southern Cape: it was found wedged into the eye socket of an infant in a burial site in a cave shelter. Arguably the most famous and certainly the oldest known manuport in the world is the "Makapansgat cobble". It resembles a human face, and has been dated to 2.95 million years. The inference is that someone appreciated the facial likeness - and maybe the red colour - and picked it up in the earliest known example of symbolic thinking. And, as we suggest in our study, geomythology - and those curious collectors from so long ago - can be a powerful way to inspire more people on the continent to become interested in Africa's palaeoscience.